Calling all fans of the Dave Matthews Band! After taking a hard-earned rest from touring in 2017 following the celebration of their 15th anniversary, they’re back and ready to rock just about every venue in the United States – coming to the Blossom Music Center on Saturday 2nd June 2018!! Tickets already selling fast – be quick on the Buy Tickets button above to get your place at the show! Formed by founder Dave Matthews alongside Stefan Lessard on bass, Carter Beauford on drums, and LeRoi Moore on saxophone with the later addition of Boyd Tinsley on violin, the Dave Matthews Band began to achieve immense popularity with their very first independent release. Their popularity blossomed in a big way, and their fourth album, “Before These Crowded Streets” went to number one on the Billboard charts, setting a trend that would follow for the next FIVE albums to come (knocking the “Titanic,” soundtrack off the spot along the way as they went). Enormous tours are nothing new for the Dave Matthews band, and this summer slog, lasting more than four months from start to finish, is no exception. Known for their extensive improvisation, the Dave Matthews Band never play the same show the same way twice! Expect incredible new renditions of the songs you know, as well as the songs you don’t! 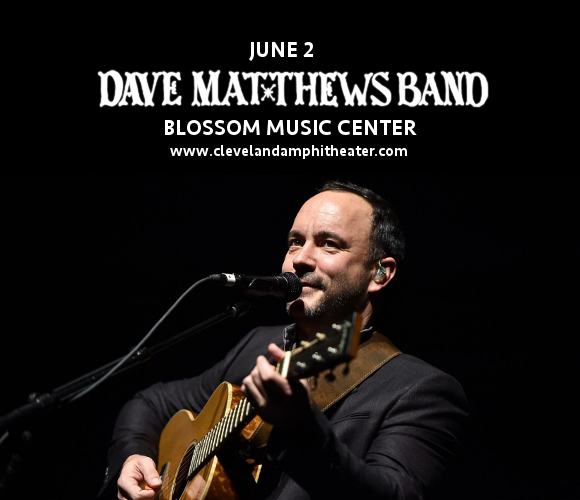 Don’t delay – get your tickets now to experience the Dave Matthews Band live performance on Saturday June 2nd! !